It might come as a surprise to most people, but when your are is running, whether you are playing the radio or using the lights, it’s not your battery that is providing the power. Instead, it is your Honda alternator. Not only that, but while it is carrying out such tasks, it is also recharging your battery at the same time. Using the rotary of the engine, which is connected by belts, the alternator runs all of the electrical accessories in your car, including the ignition and engine control systems. Most alternators use an internal voltage regulator to maintain the correct system voltage, which is different for various parts of your car. Your Honda repair manual or your dealer will be able to provide you with the proper voltage needs of your car. Contrary to what most people believe, alternators do not produce constant streams of electricity. Instead, they cycle though current needs as the engine demands go up and down. The battery serves the dual purpose of buffering the alternator from the electrical demands of the car. This gives the car just enough electricity to maintain the voltage needed to run the system. When your alternator is running at peak efficiency, the charge should be at about 50 percent of the time. 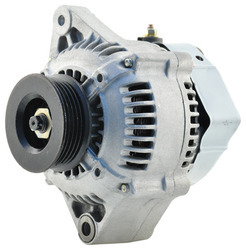 The down side of all this efficiency is that the additional requirements placed on the alternator by extraneous electrical devices such as high-power stereos, running lights, and other extras can make an alternator work even harder than it already does. Unfortunately, this often causes the alternator to go bad after about 3 to 4 years of service. In fact, when an alternator goes bad, the dead battery that results is often not the battery that is as issue. Instead, it’s the Honda alternator that should be checked and repaired.